Visit Evernew's Ti Ultralight Stacking Set page. 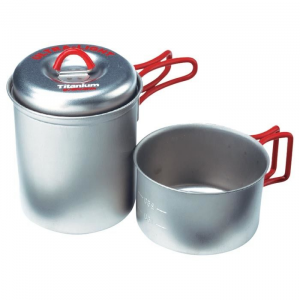 "Evernew Camp & Hike Titanium Stacking Set ECA278. 75L Pot with .4L Cup nested. Holds two small gas canisters. Insulated handle with heat resistant silicon. Mesh stuff sack included. 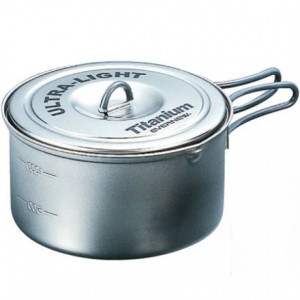 Dimensions: 3.7 x 4.7 (pot) 3.7 x 2.3 (cup). Weight: 4.2 oz (Pot) 2.1 oz (Cup). 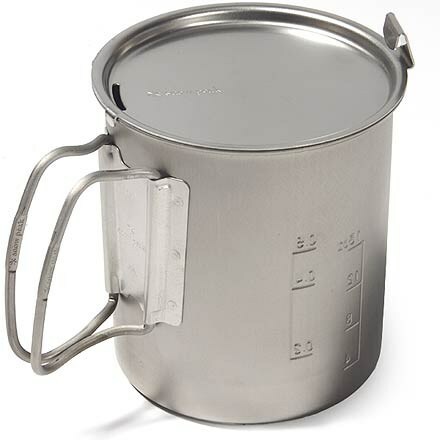 Capacity: .75L (Pot) .4L (Cup)." 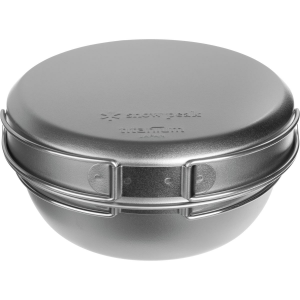 For fast-and-light backpacking, outfit your akitchena with the Evernew Titanium Stacking Set. 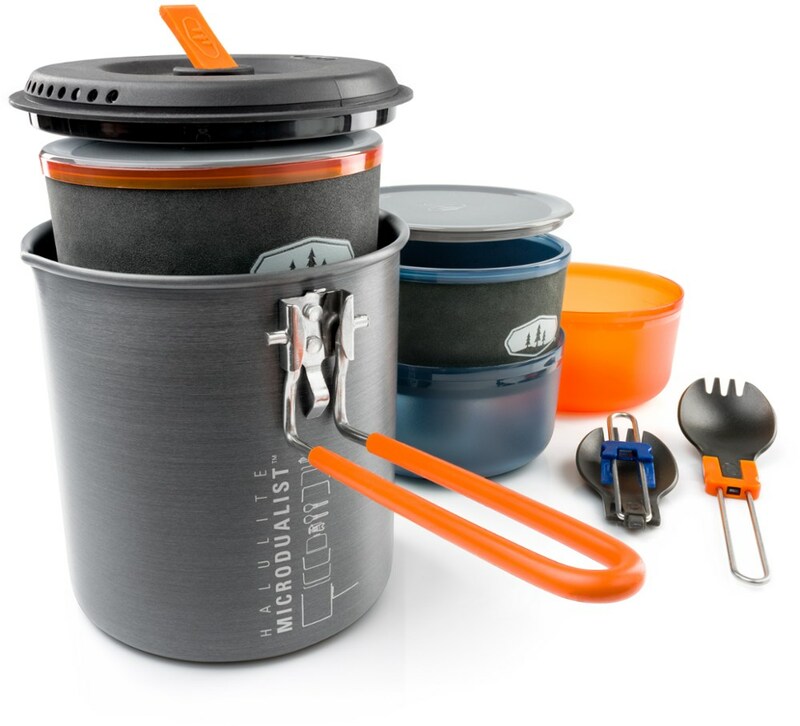 This compact set features a .4L (13.5oz) cup and a small .75L (25.4oz) pot that nest (one inside the other) for easy transportation in your pack. 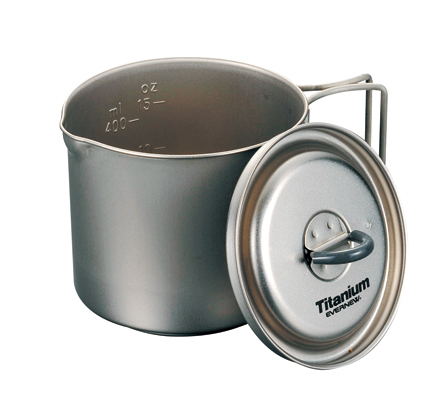 For extra efficiency, you can fit two small gas canisters in the pot, too. Because itas constructed from lightweight titanium, this set wonat weigh you down when every ounce counts. 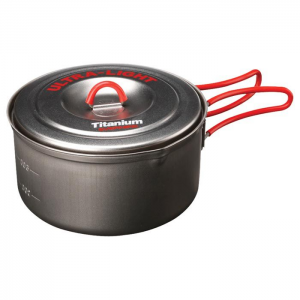 Once youave reached your campsite and are brewing up some dinner, you wonat need to worry about burned fingers thanks to the silicon insulation on the attached, folding handles.